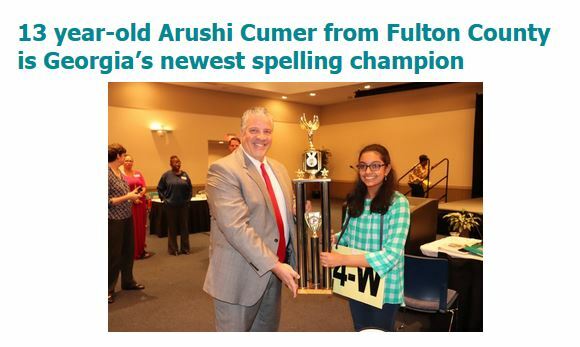 The GAE Spelling Bee Committee does not furnish any practice list of words to use for your speller. The ultimate recommended guide is using Webster’s 3rd New Unabridged Online International Dictionary as a study reference (http://unabridged.merriam-webster.com/). Also, study information such as Scripps’ Spell It! study guide is available for download by your school at www.spellingbee.com. Your school can access it and other material once they have enrolled with Scripps and have the receipt of the enrollment fee. Those materials may be downloaded and printed for the school winner for ongoing study. In addition, there is additional study information available for purchase from various websites and through apps available from Apple and Android over the Internet. 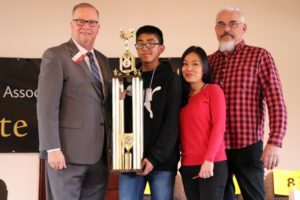 Kyu-Carlo's final score did not advance him to the finals, but GAE sends it's congratulations on putting his best foot forward as he represented Georgia in the Scripps Bee Championships. Please click here to read about our 2018 Champion and here to see winning moments.